An antique shaving stand is a great addition to a bedroom or bathroom if you are lucky enough to find one. Shaving stands were usually narrow, tall tables with mirrors on top that allowed the Victorian gentleman to take care of personal grooming easily. The tables often had a drawer or two and perhaps even doors to a narrow cabinet. The top was big enough to allow a mirror and shaving utensils to be placed on the top. Some mirrors were attached to the stand and in some cases the mirrors were attached so that they could be moved to facilitate shaving. Other shaving stands had a cut out area that held a pitcher and bowl. These are sometimes mistakenly referred to as wash stands. Wash stands or dry sinks have more surface area than the small shaving stand which was meant to be set up in an unused corner. Like any other antique, some of these were very ornate and beautifully carved while others were little more than primitive podiums that sat in the corner of a bedroom. While these stands were most often made of wood there are some that were made of cast iron. The cast iron stands can generally be dated to between 1900 and 1930. Portable shaving stands were smaller, often only 18 inches high. They had a mirror and limited storage for the razor and other items a gentleman would need for grooming. The portable shaving stand could be held on a lap or placed on a table, dresser, or desk to facilitate shaving. They can also be used in other rooms as plant stands and small side tables. In fact, they are perfect for displaying any small items that you might want to showcase. In some areas of the county like the Midwest you could expect to pick up a simple wooden shaving stand for as little as $75 while very detailed examples in perfect condition might cost well over $2,500 in an antique store in a large metropolitan area. It is always good to shop around and talk to many antique dealers before adding any antique to your collection. Refinishing and repairing any antique is not a project to be undertaken lightly. Many antiques actually lost value if they have been refinished so the first thing you should do is talk to an appraiser to make sure that your item is not extremely valuable as is. Knobs and drawer pulls can often be found on eBay. Try to match the style of the pull to the style and era of the stand. Any major repairs should probably be done by someone who is experienced in antiques. 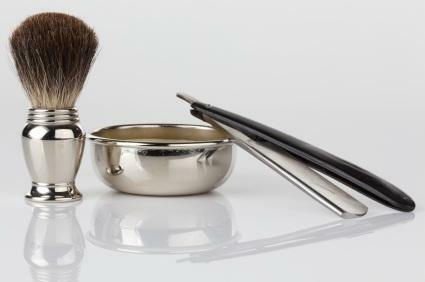 Keep your antique shaving stand out of direct sunlight and dust it often to keep it clean. Once or twice a year rub it with lemon oil to help the wood stay supple and moist. This will help prevent cracking. Using antiques is the best way to enjoy them so don't be afraid to place it somewhere for everyone to enjoy.